Comedies tend to be exaggerated. It's been a recent trend that funnier you want your comedy be, more and more exaggerated you should make it. 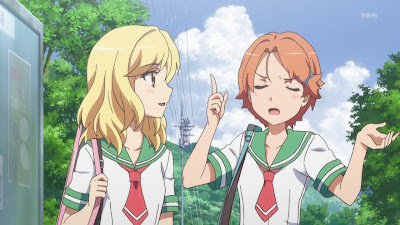 Natsuiro Kiseki however, went the other direction, which showed us how comedy doesn't have to be bouncing off the top: a lighthearted story with some subtlety could do equally as well on making people laugh. It actually reminds me much of Hanasaku Iroha in style and varieties in characters, but with a bit lighter overtone. It too break out some melancholy moments once a while. So in certain way, it might feel more like Ano Natsu de Matteru, except it's womance instead of romance ^_^. To me, it seems that they've gotten most elements right for a series like this, however, according to anime discussion sites, it seems that so far not nearly as many people are fond of this as Hanasaku Iroha or Ano Natsu de Matteru, which puzzles me quite a bit.